Seal may be available for your next special event! Seal Henry Olusegun Olumide Samuel a small town called Kilburn near Paddington, England to a Nigerian mother and Brazilian father. Shortly after Seal was born, his parents sent him to live with a white foster family in Essex, not very far from London. His mother and father were students and held part-time jobs, so the foster parents were temporary caretakers for their child. When he was four years old, his natural mother, Adebisi Samuel who was a wig maker, reclaimed Seal after his parents marriage dissolved and he lived with her in London for two years. When Seal was six years old, his mother fell ill and returned to Nigeria so Seal was sent to live with his father, Francis Samuel, who abused his son, despite Seal's admiration for him. Francis wanted him to become a lawyer or a doctor, so when Seal showed a desire to become a singer, Francis beat him even more. While some neighbors and close friends of the family have claimed Seal's father was a decent, fair and giving man, Seal still stands by his claims that he was abused. However Seal also states that experiencing a rough childhood plays a major factor into who he is today. When Seal was just 11 years old, he performed for the first time in front of an audience at his school's parent-teacher association night. He decided to sing Johnny Nash's "Bright Sunshiny Day." It was very a cappella, very unplugged as Seal recalls it. Because of his father's abuse and other problems Seal was experiencing, he ran away from his home at the age of 15 and dropped out of high school as well. When he did return back home later in his teens, it was to transport his father's ashes to Nigeria for burial. Seal also had Lupus when he was young, which left him with scars evident on his face. Before his musical career, Seal graduated from college with an architectural degree and took up different jobs around the London area, which included working at McDonald's, designing leather clothing and electrical engineering. Then after a while he began singing in local bars and clubs and joined Push, an English funk band, in the mid-'80s and toured with the band in Japan. While he was in Asia he joined a blues band from Thailand for a while. After some time with that band, he traveled throughout India on his own. In 1990, Seal contributed lyrics and vocals to Adamski's "Killer" which was a big dance hit in 1990 in the UK. This really spun the wheels in motion for his musical career and from there he started working on his debut album which would be self-titled "Seal." He released the album in 1991 with former musician, Trevor Horn, as his producer. 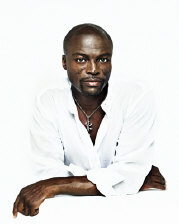 Seal released five singles from the debut album. They include "Crazy," one of his most popular songs from that album, "Future Love Paradise," "The Beginning," "Killer" and "Violet." His first album sold 1 million copies in the United Kingdom and 3.5 million worldwide. Seal also produced a compilation video for his debut album which was released in 1992 and included the music videos that were made for his singles as well as some acoustic, studio performances of some songs from his debut album. Seal also went on a European tour to promote his album. In 1993, Seal teamed up with guitar legend, Jeff Beck, to perform a cover version of Jimi Hendrix's "Manic Depression" on the "Stone Free: A Tribute To Jimi Hendrix" album. Seal and Jeff Beck also released the song as a single. After his success with the first album, Seal began work on his second album which would also be self-titled "Seal." He released the album in 1994 with a new look. He decided to get rid of his dreadlocks and sported a new, bald-headed look. He also came back with a new outlook on life and increased spirituality after his experiences over the previous three years. The album is his most successful album to date selling 700,000 copies in the UK and more than 5 million worldwide. Seal also released five singles from this album which include "Prayer For The Dying," "Don't Cry," "Newborn Friend," "I'm Alive" and "Kiss From A Rose" which is probably one of his most popular songs of his career. Seal performed "Kiss From A Rose" on the "Batman Forever" Soundtrack, which helped promote his second album and won him three Grammy awards in 1996. The Grammy awards include Best Male Pop Vocal, Best Song Of The Year, and Best Record Of The Year. The song remained at the No. 1 position on the U.S. Billboard chart for 12 weeks. Seal wrote "Kiss From A Rose" in 1988 in London. He bathed in the success of his second album and went on tour with Soul/R&B artist, Des'ree as the opening act. In 1996, Seal performed "Fly Like An Eagle," originally performed by Steve Miller, on the "Space Jam" Soundtrack. Seal has also performed on other compilations and in 1994 performed on Joni Mitchell's album, "Turbulent Indigo." She also performed on his 1994 album on the song "If I Could." Seal began working on his third album sometime after the success of his tour and second album. The album would take longer to make than his previous work because of personal life troubles, problems with his record company, and conflicts with his producer Trevor Horn. After about 3 or 4 years of hard work, Seal released his third album "Human Being" in 1998. He released the song "Human Beings" as his first single from that album. The inspiration for the song came from the murders of rappers Tupac Shakur and Notorious B.I.G. as well as Seal's own thoughts on death, self-esteem and fame. In 1999, he released the song "Lost My Faith" as a single from his album "Human Being." He released the single with a remix of the song which was featured in the ending credits of the film "Entrapment." He produced a video for the song with actress Catherine Zeta-Jones. Sometime around February of 1999, Seal began rehearsing for his next tour with Rock/Pop artist, Joan Jones as the opening act. The tour began in March of that same year. Seal's soulful, insightful and often deep lyrics has contributed to fresh, innovative and creative music throughout his career. He has captured several different musical styles and blended them into his own unique style of musical art which has pleased listeners throughout many years. His music will continue to grace music listeners for generations to come and place him among the most talented musicians of all-time. booking entertainment, such as major name entertainers or celebrities, booking Seal, booking information on Seal, or hiring Seal for your special event, or to book or hire Seal, or if you are seeking the Seal booking agent for corporate entertainment or for a private party. Consider the opportunity to book Seal or other entertainers for a wedding, birthday, anniversary, business meeting or convention. If you are not a talent buyer, we are unable to provide Seal manager or management contact information. Consider this your official Seal booking agency web site – The booking agent who works for you! This company acts as an entertainment consultant or broker/producer and does not claim or represent itself as the exclusive agent, representative or management of Seal. Seal, r&b and rock music artist - booking agent. This artist may be available for your event. Book him if you can. You will have the time of your life!